Antonio Wett was an early resident of Nelson, arriving there in about 1866. In the following 44 years, until his death in 1910, he married, had a family and worked as a fisherman in and around Nelson and Collingwood. He was born Antonio Francesco Paolo Bagnato, in about July 1837, in the small Calabrian town of Tropea, in Southern Italy. Bagnato was Antonio's Italian name, but he ‘anglicised' this name, on arrival in NZ, to Wett: ‘bagnato' means ‘wet' (as in wet and dry) in Italian. He was generally known as Antonio Wett, although in a number of documents and records, Antonio's surname, and that of other members of his family, varies between WET and WETT. There are also records of him being called Tony Wett and Tony Bonyarto. Little is known of Antonio's journey to New Zealand, other than that he initially arrived on the West Coast in about 1866, before making his way to Nelson1. It is possible that, given the origin of many of the sailing vessels arriving on the West Coast in about 1865-1866, he came from Victoria, Australia, with those pursuing gold on the West Coast and other goldfields. On the 27 August 1890, Antonio became ‘naturalised'. The papers for this event shows that: he was 53 years old at the time of naturalization; that he was born in "Tropea, Naples, Italy"; that he had lived in New Zealand for 26 years (meaning that he had arrived in NZ in about 1864); and that he was known as ‘Antonio Wet'. Antonio is recorded in the 1880 Census of Italians in New Zealand, carried out by Gerald Perotti on behalf of Luigi Marinucci, Italian Consul General in Australasia (1874)2. On the 12 March 1870, in Nelson Wesleyan Church, Antonio married Filistea Durham. Filistea's maiden name was Frost and she was born in Crediton, Devon (Nr. Exeter) UK, in about 1841. Filistea was married to Thomas Durham, a shipwright who had served in the British navy, when she arrived in Nelson aboard the vessel ‘Water Nymph', from London, on the 12 December 1865. They had a daughter at the time of their arrival in Nelson and a son was later born, just prior to Thomas Durham's death in March 1868. Nothing is known of these children after Thomas' death in 1868. Antonio and Filistea were known to have lived in Haven Road and Russell Street in Nelson. Nelson Museum has a copy of plans for a house (‘cottage'), drawn by John Scott, 20 April 1894, for Antonio Wett. It is believed that this may have been for his house in Haven Road, as Wises Directory have him living in that street in about 1895. In his later years, and at the time of his death, Antonio lived at the Wakapuaka Pa. Antonio and Filistea could have also possibly lived in Collingwood, as at least two of their children (Andrew & Agnes) were born there (in 1872 and 1876. From newspapers of the time, it appears that Antonio and Filistea's marriage was somewhat ‘tempestuous', if not violent at times. On the 3 June 1880, Antonio was arrested for stabbing Filistea at their home. It apparently arose from a domestic argument. Newspaper stories of the subsequent trial noted that: ‘the domestic row was a continuation of many that apparently happened in the household'; the "woman by her intemperance and immoral conduct frequently driving the unhappy man almost to distraction"; the ‘stab wound was prevented from being worse, and probably saving her from being killed, by the whalebone stays of her chemise'. There were three children known to have been born to Antonio and Filistea, Elizabeth Ellen, Andrew James & Agnes Pauline. Elizabeth was born in Nelson on 17 May 1871. She unfortunately died young, on the 7 August 1897, under strange circumstances Her death resulted in a Coroners Inquest4. She is buried at Wakapuaka Cemetery, next to her mother and father. Andrew was born in Collingwood (Golden Bay) on the 24 October 1872, and baptised at St Peter & Paul's, Waimea West, on 5 December 1872. Both Andrew and Elizabeth were known to have attended St Mary's Industrial School in 1882. Andrew married Ada Booker, the daughter of a Blenheim stone mason, on the 23 February 1898. They had three children: Ronald Hector James; Herbert (Bert) Antonio; and Sydney Noel. Andrew died on the 11 August 1920 at Porirua, near Wellington. He is buried in the Karori Cemetery. Andrew changed his family name from Wett to Whitt, in about 1913, which is the family name by which his descendants are known today. Agnes was also born at Collingwood, on the 5 April 1876; some records show her second name as Paulina, which may reflect Antonio's influence in her naming, as his mother was named Paola (an Italian version of Pauline). On the 7 November 1894, Pauline married William REID. William Reid's occupation was given as fisherman, the same as Antonio Wett and it is possible that the families knew each other. Agnes died on the 1 July 1922, aged 46 years and is buried in Wakapuaka Cemetery along side her husband, who died on the 29 December 1942. Antonio died on the 5 October 1910, at the Nelson Hospital. He is buried in the Wakapuaka Cemetery, along with his wife and daughter Elizabeth. The grave was missing a memorial stone for many years, but in 2012 a new memorial stone was laid by Antonio ‘s great-great-grandson. "Mr Antonio Wett: An old city resident, Mr Antonio Wett, died at the hospital this morning at the age of 74. 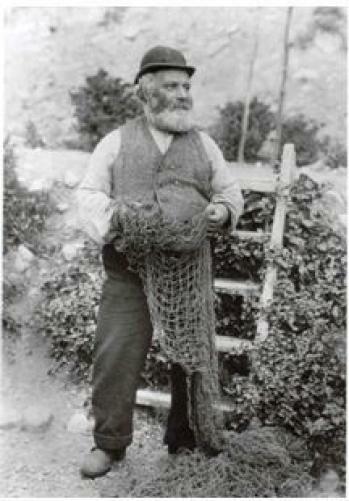 "Tony" had been well known character about town for over 40 years, having arrived in Nelson from the West Coast and having followed his vocation as a fisherman ever since, except when laid aside by sickness"
"Antonio Bonyarto, better known as Tony Wet, was a fisherman of Italian parentage, and a powerful swimmer at the Regatta Day held each Boxing Day. In the event ‘Hunt the Duck' he would always represent the duck, and would stay under water for long periods while other swimmers would try to catch him. He died 5 October 1910 in Nelson Hospital, aged 77 years." Want to find out more about the Antonio Wett ? View Further Sources here.